Some leftists have declared recently that Donald Trump’s presidential campaign is fundamentally “anti-political” rather than right wing. But the evidence they offer actually highlights the similarities between Trump and earlier right-wing populist candidates Patrick Buchanan and George Wallace. This debate also highlights the need to combat both Trump’s demagoguery and the political establishment he is railing against. “Take, for instance, Trump's unexpectedly aggressive attack on the Bush presidency for lying about ‘weapons of mass destruction’ to justify the Iraq War. Or his recent call for the U.S. to play a more ‘neutral’ roe in the Israel/Palestine conflict--a sharp (and controversial) break with the staunchly pro-Israel GOP. Tietze thinks that we shouldn't take Trump’s racist rhetoric too seriously. He claims it's simply Trump's way of showing up the political establishment’s weakness and “attracting attention by causing an uproar,” and that Trump “has started to soften his pitch” as his campaign has gotten stronger. Tietze argues further that “Trump’s strongest support is from GOP voters who self-identify as ‘moderate/liberal,’” and that it’s a mistake to interpret his popularity as “some kind of significant radicalisation on the Right,” as many leftists and others have done. Frank has no illusions that Trump actually cares about workers, but argues that his criticisms of free trade “articulate the populist backlash against liberalism that has been building slowly for decades.” Reducing Trump’s appeal to the single issue of racism obscures this reality. These articles raise issues that need to be addressed. As Tietze, Robertson, and Frank contend, Trump’s message and popularity can’t be reduced to racism alone. The articles are helpful for focusing attention on Trump’s hostility to the political establishment and for detailing some of the ways he doesn’t sound like a conservative. But it’s frustrating that all three of these authors write as if conservatism is the only kind of right-wing politics, and that all three of them treat Trump’s anti-establishment rhetoric as separate from, and at odds with, his racism. In reality, combining crude or distorted anti-elitism with scapegoating and attacks against oppressed communities is the very essence of right-wing populism. That’s not a new idea, and it’s certainly not a new phenomenon. To take this further, the specific ways that Trump combines overtly right-wing and “moderate” or “liberal” positions closely track earlier right-wing populist presidential candidates, specifically Pat Buchanan and George Wallace. Both Buchanan and Wallace ran campaigns in which ethnoreligious bigotry and reasserting white dominance played a major role. But both of them combined this with anti-establishment positions which, in different ways, broke with conservative orthodoxy. George Wallace’s brand of right-wing populism was different. Although he ran in the Democratic presidential primaries three times, Wallace is better remembered for his 1968 run on the American Independent Party ticket. His 1968 campaign defended segregation but downplayed explicit racism; it denounced centralized government but — as part of Wallace’s appeal to working-class whites — embraced welfare state policies. Many of Donald Trump’s more “liberal” domestic positions, such as expanding education funding and rebuilding infrastructure, are like a muted version of what Wallace advocated 48 years ago, such as higher Social Security payments, universal access to medical care, and a guaranteed right to collective bargaining. Because of these positions, Wallace was called a liberal by Republican opponents, much as Trump is today. Only if we ignore this history does it make sense to call Trump’s message “inconsistent,” “irrational,” or “chaotic.” Not all of Trump’s positions follow right-wing populist precedent, but most of them do, and even the outliers may follow a related logic. For example, Michelle Goldberg suggests that Trump’s refusal to demonize Planned Parenthood (he wants to defund it for performing abortions, yet points out that it helps millions of women with other health services) is reassuring to “downwardly mobile white voters who hear how terrible Planned Parenthood is… but who nevertheless rely on the organization for reproductive health care.” That’s an eminently rational approach to take if you want to build a right-wing populist campaign that stands apart from your conventional conservative rivals. A classic hallmark of right-wing populist movements is that they attract people in the middle echelons of the social hierarchy, who have genuine grievances against economic and political elites above them, but also want to defend their limited, relative privilege against challenges from oppressed groups below. Right-wing populism takes that mix of resentments and channels it in ways that reinforce oppression and hierarchy. This describes Trump’s campaign perfectly. I can well believe that only a fraction of Trump’s supporters are drawn to his campaign because they they’re actively committed to racist ideology. And while a willingness to ignore racism is certainly a minimum requirement for supporting Trump, that’s not unusual. Millions of white Americans, including many Trump opponents, ignore racism all the time. So it’s true that Trump isn’t just tapping into some pre-existing white nationalist constituency — instead, he is building one. By melding anger against Washington politicians with hatred and fear of Mexicans, Muslims, and people of color in general; by identifying political honesty with open expressions of bigotry; by turning his rallies into events where racist and anti-leftist violence is treated as normal and good; and by giving his followers an iconoclastic leader to rally around, Trump is doing his part to reverse the white nationalist right’s weakness and fragmentation that Robertson finds so reassuring. Against Robertson’s belief that Trump is just a “chaos candidate” who’s unlikely to build anything of lasting impact, I see Trump as the current focal point for an increasingly coherent and dangerous right-wing challenge to neoliberalism. Benjamin Studebaker argues persuasively that this is one after-effect of the 2008 economic crisis. “Economic ideologies change when there is an economic disaster that is seen to discredit the prevailing ideology. The Great Depression discredited the classical economics practiced by right wingers like Calvin Coolidge, allowing for left wing policies that in the 1920s would have sounded insane to ordinary people. The stagflation in the '70s discredited the Keynesian egalitarianism of FDR and LBJ, allowing Ronald Reagan to implement right wing policies that would have been totally unthinkable to people living in the 1960s. Studebaker argues that neoliberalism has dominated both major parties since Jimmy Carter’s presidency in the 1970s, but now it’s being challenged from two sides: on one side Bernie Sanders’s “left egalitarianism” (essentially an updated version of the New Deal and the Great Society), on the other the “right nationalism” of both Donald Trump and Ted Cruz. And while neoliberals will likely keep control of the Democratic Party this year (via a Hillary Clinton nomination), Trump’s prospects to bring about a realignment of the Republican Party are all too strong. Sixteen years ago, in Right-Wing Populism in America, Chip Berlet and I called for a two-pronged strategy to deal with this kind of threat: broad alliances to expose and confront rightist scapegoating and violence, but also radical initiatives to attack the structural inequalities that right-wing populism exploits, and to challenge centrism and liberalism’s harmful and repressive policies. This same dual approach remains necessary today. I support Chip’s urgent call for “organizing now to protect the people being demonized and scapegoated as targets of White rage,” and to “build broad and diverse local coalitions that tactically address local issues while strategically linking them to national struggles.” I also support Dave Zirin’s call on Facebook to “build a fighting left that challenges what Trump is giving voice to: white nationalism as a response to the crisis people feel in their lives.” As Zirin urges, “Every Trump rally should be protested and disrupted…. 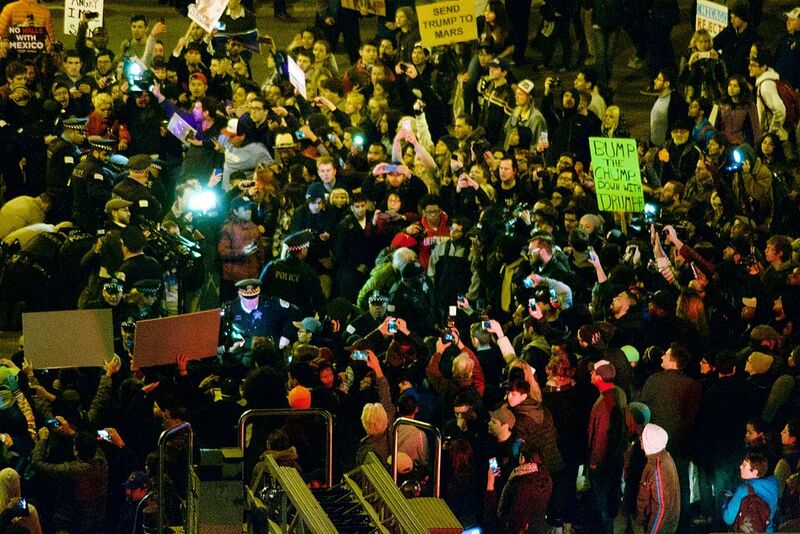 Repeat: Every Trump rally should be protested and disrupted.” The recent protest at a Trump rally in Chicago — spearheaded by black, Latino, and Muslim university students — won an important tactical victory when Trump cancelled the event rather than face his opponents. “How do we scale up the scrappy efforts currently underway by grassroots organizations [such as the Rural Organizing Project, is a statewide community organizing project in Oregon] to meet the needs of impoverished, isolated rural communities, as well as working-class and poor urban communities? How do we diminish the appeal of groups like the 3%s, Oath Keepers, and other paramilitaries formations that are speaking to peoples’ fears and the hatred that has been manufactured over generations by people with an interest in distracting us all from whose hands are actually in our pockets? And compete with the real way they are speaking to the material needs of people who are struggling to get by and do not feel supported or valued? I certainly don’t know the answers to Clare’s questions, although I expect there’s a lot to be learned from groups such as the Rural Organizing Project, as well as earlier examples such as the Young Patriots Organization, a radical group formed in 1968 Chicago mostly by poor whites from the South. But this issue is important: it is one of the most important challenges we face. The other part is to cut off right-wing populism at the root. Tietze, Robertson, and Frank are correct that Trump’s campaign is fueled by rage at the neoliberal establishment, so if we want to cut off that support, we need to give people better ways to channel that rage, radical alternatives that speak to their reality. I don't buy any of that-- that Trump's campaign is fueled by rage at the "neoliberal establishment." It's fueled by racism. The Republicans have been cultivating racism as the mule to transport their so-called "economics" and "neoliberalism" for 50 years. All the neoliberal crap has been codes for attacks on the meager attempts made to advance equality. And with the election of an actual African-American to the presidency, there is no longer any reason for the neoliberal cover. That the Republicans are now horrified that Trump is violating their so-called "platform"-- speaking against TPP or NAFTA; denouncing the war in Iraq as based on lies; simply makes it clear how little "neoliberalism" has to do with the core to US electoral politics-- which has been and particularly since 1960-- what's the best way to control people of color? That Trump is now more than less dispensing with the codes and explicitly appealing to racists doesn't mean we can "speak" to "those people" and give them an "alternative" way to "channel that rage." If there ever was a "liberal" response to a class struggle that's it. Our appeal needs to be to the migrant workers, to the most exploited sector of the working class, and it has to begin with proposing the dismantling of the Immigration and Customs Enforcement raids and attacks on workers. Racism may be a bulwark of Trump but his campaign implies more than that. Trump is a spectacle, whose politics will go wherever his personality cult brings him. Whites- LGBTQ, leftists, lumpens, women, hippies, Jews, etc.- are also threatened by whatever status quo he helps usher in. His own supporters can't even benefit from him. He's a giant marshmallow. Some readers have criticized this article as under-playing the role of racism and Islamophobia in mobilizing Trump supporters. I accept this criticism. At points in the article it sounds like I’m saying that anti-elitism is the main reason people are rallying to Trump, and that’s really not what I meant to say. Trump is certainly using racial and religious scapegoating to mobilize people, extending and intensifying the kind of scapegoating that other politicians have perpetrated for years. And while you can find serious examples of racism in all of the other major campaigns — from Cruz to Clinton to Sanders — the Trump campaign is in a class by itself. There is clear evidence that Trump supporters are significantly more likely to express “white ethnocentrism” and anti-Muslim bigotry than are others polled, including other Republicans. But I don’t think that’s enough to explain Trump’s appeal. Because railing against the political establishment is also a big part of his message, and a big part of what people say they like about him. I think it’s the combination of ethnoreligious scapegoating and twisted anti-elitism that’s key here, as it has been over and over in U.S. political history. If we ignore that combination and say it’s simply racism, we’re missing something important, just as Frank, Robertson, and Tietze miss something important by minimizing or denying racism’s role. With regard to your other criticisms: (1) I think U.S. electoral politics is very much about both controlling people of color and (since 1980, at least) upholding neo-liberalism -- as supported by your own examples. (2) I certainly agree about the strategic importance of appealing to the most exploited sector of the working class, including particularly migrant workers. But I also think it's strategically important in a different way to appeal to working class whites, including some of those who are attracted to Trump. I don't mean pander to people's racism, I mean offer a radical analysis that speaks to their experience, including both exploitation and relative privilege. There is definitely a "law and order" component mixed with the nativism in Trump. That is, with the protectionism. The talk about "Mexico sending their worst" plays both to the tough on crime crowd and to the protectionist crowd. This is why the silent majority line really fits. The silent majority idea was mostly about law and order in a time of racial tension and increasing violent crime, noth were often related. In Trumps case it's Mexicans taking jobs and lower wages and committing henious crimes. So you get this crossover effect of drawing in traditionalists and the white working class the same way Nixon did in 1972. But Nixon was the last "liberal" republican president. Since Reagan's revolution, the conservatives, who are very pro free market, have been taking over the GOP and so we've had this "sorting" effect- where a party sorts out all but one or a few competing factions- just like how the Dixiecrats leaving the Dems sorted the Democratic party into a solid liberal party. Trump is in effect, undoing the sorting. Or at least he is trying to. I think he will fail miserably to win any general election. Ya'll in Europe don't understand this because y'all have mass parties which came to politics already sorted and with party discipline. In the US, mass parties with notions of party discipline never formed, we held onto "caucus" parties of elites who negotiate between themselves and their electoral constituents.